Well, I had planned to cover a few different subjects for this newsletter but a couple of pieces of information I need for it are taking their ever lovin' to come in, so I thought it best to get a shortened version out in the mean time. The promised subjects and more will be in the following newsletter, just around the corner. In this newsletter we'll continue the series, when the market stalls, exploring the ins and outs of selling pyrography at markets and shows. We'll also have a look at 'negative pyrography' and the Melbourne Wood Show. Finally we'll have a look at the differences between British/Australian wire nib burners, versus North American. P.S. Don't forget to watch out for all the major changes coming to the site! In the last issue of 'when the market stalls', we covered the external forces that can influence your pyrographic sales at a show, fair or market. We'll now start looking at the internal forces that can greatly affect sales… yourself, your product and your setup. For now, let's start by examining your product. How many of these people, who decide to give selling their pyro work a go, come away from the show with a sick feeling in their bread basket? Not only did they make few or no sales, but worst of all, they have lost their faith in what they do. They no longer think Grandma Flo is right….in fact she must have the worst taste in the world…or she was just being nice. And those spice racks hardly raised an eyebrow…it was like…well….it was like everyone already has a spice rack or something! Well...there lies the problem. Just about everyone does have a spice rack. Even if they LOVE your spice racks, it's going to be hard for them to justify spending good money on something they already have. Yes, a few might decide they just have to have one. A few might think it would make a lovely present, but these people will be few and far between. There are simply only going to be so many people who want a spice rack. What of 'Cat Plaque Lady'? They might indeed be very nice cat plaques. People are bound to ooh and ah when they see them. Grandma Flo was right! They are very attractive in their own right. But ask yourself, what percentage of people shopping that day are really going to want a cat plaque? I have seen and heard about a ton of pyrographers that have come away from their first show severely disappointed. It's terrible to see, because you know it's not so much about the lack of sales that is hurting them, it's about how low they now feel about their craft and art. The crippling drop in confidence. How it used to feel so sweet. You could look at your own work with a sense pride. You stood out a little. People really seemed to like what you did…you really liked what you did. You couldn't wait to get back to the latest project. Now you can barely look at it. Look…there is a case that some people who go to markets are truly awful at what they do. I know we have all looked at them and wondered how they got the courage to come in the first place. But have you noticed how those same people also tend to sell? Why? Because they are filling a niche. They usually have a large variety of rubbish that they are selling at cheap prices. The niche they are filling is two fold. They are cheap and they have a greater variety that suits a larger audience. Now, I'm not saying cheap is the way you have to go when selling at markets. Nor am I saying you have to have a HUGE variety of work. What I am saying is you have to appeal to as many people as possible given the work you do and the prices you charge. 'Mr. Cheap and nasty' does this by covering a wide range of tastes and a wide range of pay packets. He is going to get a wider audience considering this. 'Cat Lady' does not do this. She appeals to a narrow audience of cat lovers and her plaques take time to produce, so she has to charge more. Even if her work is stunning, she has alienated a large portion of her potential audience by default. 'Spice Rack' has also done the same. He has done a little better in one regard, his racks are very affordable, but then, a lot of people have a rack, so that narrows the field once again. How can Cat Lady and Spice Rack improve their chances of improving sales? DIVERSIFY! Think of yourself and your booth as a big fish net. If the holes in the webbing are too big, you will only catch a small variety of fish…the others will slip through. Think of your product and services as net string. Each time you add another piece of string, you close the gap in another big hole. The smaller the holes, the larger variety of fish you are bound to catch. The larger audience you will appeal to. Let's now look at Spice Rack and Cat Lady with new eyes. How can they diversify to improve their situation? Cat Lady would do very well to include some 'bread and butter' lines. 'Bread and butter' products are the kind that loose change or a small note will buy. Here's my theory. When you go to a market, show or fair, you are always going with the thought you might buy if something appeals to you. The ultimate intention is to buy. If there is nothing that appeals to you or it is too expensive, there is often a sense of let down. It's kind of like going to a great book sale or tool sale and not finding something that instantly appeals, that you have to have. What do you often end up doing? Ah huh…buying something you don't really need, for a bit of change because you really didn't want to go home empty handed. You also didn't want to be too silly and buy something you don't want for a heap of money, so you compromise in your head and come away with a little purchase. This is the bread and butter line. It's the product the kids buy, it's the surprise gift, it's your little treat…it often costs less than $5.00, but can be around $10.00 and it's AMAZING how fast they add up! I have done large shows where, out of a large money turn over, the bread and butter line produced 40/50% of it. So let's get Cat lady to do her cats on more things than just plaques. The possible range is huge. Have a good think about this. What would you burn your cats on that would appeal to a greater range of people and pockets? How about having a standard line of pure bred cats burnt on a set line of products, then offering to burn the name of their moggy on the product at the market. Finish with a water based sealer and you could fill the orders on the spot. What about cat fridge magnets? How about wooden keyrings….leather? How about sayings…'I love my Persian'…'I meow, I vote'…'fluffy is fun! '…'black cats are good luck'…'Tortoise Shells are not confused, they just look that way'. I could ramble on and on here, but you get the drift. What about Cat Lady diversifying her shows? What if she went to her audience and sold to a cat show? What if she approached a pet shop? A cat club? What if she thought, 'if I can do cats, I should be able to do dogs'. There ya go! She has just more than doubled her audience with opening her range to include another subject. Spice rack is more of a 'functional burner'. He makes a product and burns words and simple designs on them. So far it's only been spice racks. But if he can make spice racks, well, he can make a myriad of things to burn and sell. Place mats, house signs, knife holders, frames, letter holders, key ring holders etc etc. Sure, many people already have these, but they are burnt, they are unusual…some people are going to buy them for themselves and presents. The more variety Spice Rack has, the more chance he is appealing to a wider range of people. So, they might not want the spice rack, but that fancy chopping board would absolutely set off that corner of their kitchen. Spice Rack can also look at more bread and butter lines...wooden spoons, book ends, letter holders and keyring holders etc etc. The other thing Spice Rack can do is come up with some unique products. Sure…lots of people sell small house ware, but what if Spice Rack comes up with something unique…the wow factor. How about a multi tiered, collapsible spice rack…. with brass fittings. As you pull it apart, each herb/spice place is pyro'd…. the family name pyro'd…. a bouquet of herbs pyro'd as the outer design. Let your imagination go wild. The last thing we have to consider is if you really should try and sell. What if you are happy giving your work away? Selling the odd piece at work maybe? Keeping it as a legacy for your family? Giving it to a charity? Going to a club gathering and sharing but having no desire to do the market thing that people are encouraging you to do. Should you do it? I mean, would that prove how good you are? NO. It will not prove how good you are. Be happy in yourself…with your work…enjoy. If you are dying to try your hand, there is no harm paying a small fee and giving it a go. It can be immensely satisfying and fun. It can be financially rewarding, but don't expect a fortune. In time you may want to chance bigger shows. But above all, please do keep in mind; sales are NOT an indication of your worth as an artist and crafts person. Marketing is an art you will have to consider if you wish to be successful in self- promotion and sales. An awful lot of components go into a successful result. Diversity and finding a niche are large components that can't be ignored. Recently I showed some samples of negative pyrography to a group of pyrographers on a message board. The resulting feedback was very positive and the interest high…so I thought I'd quickly touch on the subject here. What is negative pyrography? Think of the negative of a black and white photo. Instead of the subjects being dark and the background being light, the reverse is seen…the subject is light, the background dark. This is essentially the principle behind negative pyrography. The most common way of doing this is seen in the Celtic piece below. The main outlines of the design are burnt and then the outer part is blackened to make the design stand out in contrast. This can be a time consuming process, but very effective. A less controlled and more unusual method is engraving into a pre-blackened wood. It is equally effective, faster and more moody in it's effect…but a little more difficult to depict detail. In this method the wood is blackened either by burning with a butane torch or by a pyro machine. 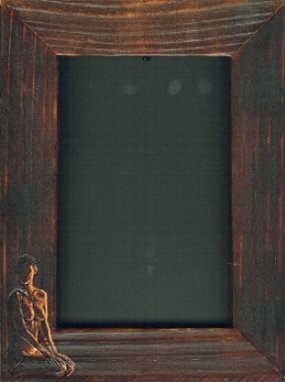 The image is engraved back through the black until raw wood is encountered…contrasting with the dark surround. A Dremel type tool with a burr is best used for the engraving. For these pieces I have used a metal engraver and a small, round diamond burr. They allowed for the subtle removal of the blackening, in layers. If I took away too much, it was a simple matter of adding with my pyro burner. These particular pieces were all done on pine. I have not tried this technique with other wood, but I'm quite certain it's possible and look forward to experimenting more as I'm very pleased with the effect. I'll be doing a tutorial or booklet about this in the future, probably with a project on the night cityscape and perhaps one other project. Both will be easy enough for the basic burner to do. Stay tuned to this newsletter and www.suewalters.com web site for announcements. If you like woodworking or anything to do with it and you happen to live in Australia, do yourself a favour and check out the next Australian working with Wood show, coming to a capital city near you. And for the Kiwis, it's coming to Auckland this year! Not only will you see every tool and product relating to woodworking, you will also see craftspeople and associations demonstrating their skills. Yep…you'll even see me at the Sydney, Canberra, Adelaide and Melbourne Woodshows! So be sure drop in to see me demo, ask a question or just have a good look. While you're there, be sure to check out the fine Woodworking competition that is featured at each State's show. Hey, why not join in the competition yourself? Pyrography is an acceptable entry under the category of decorative woodworking. If you have high quality, original pyrography, it might be worth thinking about. Each States competition culminates in the Australian National Woodworking Competition, held at the last wood show in Melbourne. The standard at this years final was excellent and well worth a look. Pyrography competed well and took out first in Decorative Woodwork and 3rd best of show. The placings really did open many eyes to the world of pyrography...good stuff! If you are interested in entering your fine pyrography or woodworking (all categories), call Lucy Dean on 02 9565 1099 for details and an entry form. If you would like to catch up with me at other venues, they will be announced in the 'Where to find Sue' section that will soon be available on site. EASY TO USE WIRE NIBS, WHY SHOULD NORTH AMERICA HAVE ALL THE FUN? As many burners know, there is quite a bit of nib difference between the wire burners of Australia/Britain and those of North America. I myself, being Australian, have a traditional wire nib burner that we most commonly see here and in Britain. I was aware the North American variable temp wire burners had nibs that came in a great variety of styles and seemed factory formed compared to my own. My burner required me to either buy a basic nib or form one from a length of nichrome wire. This nib resembles what North American burners know as the writing nib. This is what my style of burner had been lacking and what is the main difference between the two types…those preformed nibs. Aussie/Brit wire burners will well know the frustration and limitation of doing most of their work with a writing nib…of fighting grain to do a smooth, clean line…or going nuts trying to do half decent shading. So, do Aussies and Brits miss out? Do we just do without the magic skew that burns beautiful, crisp lines...even over pine! Are we never to have a decent shader? One that covers large areas with smooth tone. Of course we can!! In the next issue, we'll find out more. Don't think of your woodburning tool as just a hot pen or pencil. The burning tool is one the few writing implements that can texture as well as draw. When looking at a prospective subject, don't just think of it in terms of light and dark tones, think of it also in terms of TEXTURE. Everything has texture, from the smoothness of a shiny apple, to the coarseness of a bison coat. Depending on the nib and your imagination, the pyro machine has the ability to recreate just about any texture you will find in this world.